Studio Line: Universal Studios - A war's defining battle. A nation's defining moment. The battle of Midway sounded its furious thunder in June 1942, just six months after the attack on Pearl Harbor. Midway interweaves the dramatic personal stories of the men who fought the courageous battle that was to be the Pacific turning point for the United States. The all-star cast and breakthrough war footage convey the Battle of Midway with powerful reality and epic sweep. DVD: Widescreen 2.35:1/16x9; audio English Dolby Digital 1.1, Spanish & French Dolby Digital 1.1; subtitles English; closed-captioned; single sided - dual layered; 18 chapters; rated PG; 132 min. ; $24.98; street date 10/30/01. Supplements: Original Featurette; “The Making of Midway” Documentary; Featurette on Composer John Williams; Production Photographs and Portraits with Score by John Williams; “Sensurround: The Sounds of Midway” Featurette; Additional Scenes Exclusively Shot for Network Television Version; “They Were There” Hosted By Charlton Heston; Trailer; Production Notes; Cast and Filmmakers. What with the moderate success of this summer’s Pearl Harbor, we’ve seen a minor influx of DVDs related to World War II. Most of these arrived closer to the release date of the Michael Bay piece, but more continue to come. Among these is a story that took place a few months after the events of Harbor: 1976’s Midway. In many ways, Midway strongly resembled another WWII-oriented flick of the era, 1970’s Tora! Tora! Tora!, though Midway certainly seemed to be a much more positive tale for American audiences. Set in mid-1942, Midway depicts the battle for those Pacific islands. The US success there was regarded as a turning point in the war, and the movie follows the events of the time. As with Tora!, Midway mostly does this via military sequences. We watch as the US forces get wind of the imminent Japanese action and try to sort out fact from fiction. We also see the Japanese plan the attack and observe conflicts from their end. The tale features mostly true historical figures like Japanese Admiral Yamamoto (Toshiro Mifune), US Admirals Halsey (Robert Mitchum) and Nimitz (Henry Fonda), Commander Rochefort (Hal Holbrook) as well as less famous fighters. In addition, the movie creates some new roles, mainly to add some non-war related subplots. We find Captain Matt Garth (Charlton Heston), whose son Thomas (Edward Albert) also serves in the military and is stationed nearby. Controversy arises when Tom tells his dad that he plans to marry Haruko (Christina Kokubo), a local with Japanese ancestry. This romantic subplot winds its way through parts of the movie, but it never really goes much of anywhere; it seems intended mainly to add some female talent to the otherwise relentlessly manly crew. Other than that sappy aspect of the film, however, Midway does a pretty nice job of covering the events of the battle. It features a stronger US-tone than did Tora!, but that’s fine with me, as I actually found the latter to be a little too respectful of the Japanese; while I don’t like to see them treated like demons, I think the attack on Pearl Harbor was too horrible an endeavor for them to receive so few lumps. Midway puts the two parties on a more even keel, since they were formally at war during the era; this would be no unprovoked attack ala Pearl. Interesting, as depicted in Midway, the battle comes across as almost a mirror image of Tora! During that film, we saw how everything went right for the Japanese, while the US ran into many snags and missed opportunities. The opposite case holds true during Midway, as the US gets all the breaks and problems beset the Japanese forces. As a whole, Midway resembles many other big-budget flicks of the era. Like the disaster films of the period such as The Towering Inferno and Earthquake, it operates on a grand scale and incorporates a huge cast with many familiar faces. That includes some then unknown who would become famous, such as Tom Selleck. Unfortunately, this formula often meant that we’d get some fairly uninspired filmmaking, and that holds true for Midway. It seems so large and unwieldy that it becomes too conservative much of the time. It tends to proceed on a somewhat plodding path at times and it doesn’t always live up to the potential of the material. Say what you will about Michael Bay, but at least he knows how to execute a good action sequence. Actually, many of the battles found in Midway also work very well. As with Pearl Harbor, the film’s character-oriented scenes are its weakest, but since Midway features many fewer shots of this sort, they drag down the movie to a much smaller degree. As for the war scenes themselves, they seem a little flat and unimaginative to a point, but they deliver the goods for the most part. Much of the film covers those elements, and they offer enough excitement and drama to make the movie worthwhile. One curious aspect of Midway stems from its actors. Most of the Japanese personnel are portrayed by Americans of Japanese descent, including Pat Morita of Happy Days and Karate Kid fame as well as Die Hard’s James Shigeta. This means most of them speak with somewhat bland American accents, and it subverts the intended authenticity to a degree. One of the actors who actually came from Japan didn’t help. Toshiro Mifune was the big Japanese performer in the bunch, but unfortunately all of his lines were dubbed. If I heard correctly, they were done by Paul Frees, the voice-over artist well-known to aficionados of Christmas specials like Frosty the Snowman, Santa Claus Is Comin’ to Town and The Little Drummer Boy; interestingly, he also narrated the classic The Manchurian Candidate. Frees’ speech does not integrate at all well with Mifune’s mouth, and the result is almost comically awkward. Unfortunately, this doesn’t serve the movie well. Nonetheless, I found Midway to offer a somewhat lackluster but still generally engaging and compelling experience. It covered its portion of the war with admirable restraint and accuracy, and though it showed few signs of style or panache, it still managed to provide a believable and generally vivid telling of the tale. 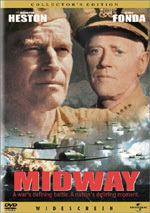 Midway appears in an aspect ratio of approximately 2.35:1 on this single-sided, dual-layered DVD; the image has been enhanced for 16X9 televisions. Overall, I thought the movie showed a decent picture, but it definitely betrayed its age at times. Sharpness generally came across as reasonably solid. Most of the movie displayed distinct and accurate images that were nicely defined. However, some wider shots appeared somewhat soft and fuzzy at times. I discerned no problems related to jagged edges or moiré effects, and I also witnessed no signs of edge enhancement. In the case of Midway, print flaws became an unusual issue due to the nature of the project. Midway included a fair amount of vintage footage from the actual battles. Not surprisingly, this material looked pretty bad. In addition to being very soft, these shots demonstrated lots of grain and other defects. However, that was to be expected, so I didn’t factor these problems into my grade. As for the material filmed specifically for Midway, those elements generally looked reasonably clean, but they also presented some concerns. Light grain appeared at times, and a mild mix of grit, speckles, and other small defects cropped up throughout the movie. Effects shots suffered from the most problems, though little flaws could be seen during a number of other sequences. Overall, the movie certainly showed a mix of issues, but it seemed acceptably clean nonetheless. Colors appeared somewhat flat and muted, but they weren’t really a concern. I didn’t expect a vivid and vibrant palette for this sort of film, and the hues generally fit in reasonably well with the atmosphere. They probably could have come across as a bit more distinct and bold, but as a whole they looked decent. Black levels appeared fairly deep and rich, while shadow detail was usually nicely dense but not overly opaque, even during the “day for night” shots; those instances often render scenes excessively dark, but that didn’t really occur here. Ultimately, Midway provided a good but unexceptional visual experience. For Midway, we found an unusual soundtrack. The film boasted a Dolby Digital 1.1 mix. This meant it was monaural but offered subwoofer usage as well. The “.1” aspect served to replicate the movie’s original Sensurround effects. As a child of the Seventies, I remember Sensurround well. In fact, of the three Sensurround flicks I recall, Midway was the only one I never saw theatrically; I loved disaster films, so I eagerly took in Earthquake and Rollercoaster. While the .1 track for Midway provided some additional depth, it didn’t exactly replicate the theatrical experience. For much of the film, the sub gave off a general low hum; it seemed more like an atmospheric element than something designed to shake the walls. That part of the track existed mostly when planes flew, however, so it made sense within those parameters. Explosions and other loud noises kicked the sub to life more vividly. The bass seemed somewhat boomy and indistinct, but it still appeared acceptably deep and prominent, especially given the film’s age. As for the quality of the rest of the track, it seemed acceptable for the era. Speech sounded a little edgy at times, but dialogue generally came across as reasonably natural and distinct, and I detected no problems related to intelligibility. Effects showed a little distortion at their loudest, but those issues were rare, and they usually appeared to be fairly clean and accurate. John Williams’ score boasted surprising clarity and depth, as the music showed pretty decent brightness as well as nice low-end response. A little hiss could be heard at times. Overall, the soundtrack suffered from some limitations of its era, but it offered a good piece as a whole. This “Collector’s Edition” represents the second DVD release of Midway; the first came out in 1998 and lacked any of this set’s enhancements. Though not packed with goodies, we do find a nice little roster of extras here, starting with a new documentary called The Making of Midway. This program lasts 38 minutes and 50 seconds as it combines the usual mix of film clips, production photos, and new interviews. In the latter category, we hear from actor Charlton Heston, director Jack Smight, producer Walter Mirisch, and editor Frank J. Urioste. The main problem with the show stems from the movie clips. It includes far too many of these, especially since the documentary was clearly intended for the DVD; the folks who would watch the program already owned the movie as well, so they became terribly redundant. Otherwise, however, the piece offers a good look at the subject. We hear the basics of how the project got started and cast, and also learn of many aspects of the shoot itself, mainly via interesting anecdotes. The documentary discusses the material filmed especially for the TV version of Midway as well the manner in which it integrated clips from other sources - real military footage along with snippets from other Hollywood offerings like Tora! and 30 Seconds Over Tokyo. We learn a little about Mifune, but unfortunately no one mentions the dubbing. Like Midway itself, the documentary is somewhat flat and pedestrian, but it still seems informative and reasonably entertaining. Next we find The Score of Midway. Not surprisingly, this six minute and 20 second piece focuses on the flick’s score. It uses the same format as the documentary; in its interview portions, we hear from producer Mirisch and director Smight but most of the chatter comes from composer John Williams. He offers a good discussion of his history in films and his work and he provides nice insight into what he wanted to do with the score of Midway. Sensurround: The Sounds of Midway offers a brief look at the short-lived audio format. In the four minute and 15 second program, we get comments from Williams, Mirisch, Heston, Smight and Urioste as they mainly provide a general overview of the system. Most compelling was the mention that the engineers were forbidden to use any high-end frequencies; if something went wrong, the sounds could have harmed patrons’ ears. As mentioned during the main documentary, some additional material was filmed to pad out the television edition of Midway. We find a few of these in the creatively-named “Scenes Shot for the TV Version”. There you’ll locate ten and a half minutes of clips, all of which revolve around Heston’s character and his relationship with a girlfriend played by Susan Sullivan. This subplot was totally exclusive to the TV stuff, as the original movie made no mention of Sullivan’s role. To my surprise, I actually thought this material was fairly good. It created additional depth in regard to Matt’s hand injury, and the ending became a little more poignant. Note: I’ve heard that apparently a lot more extra footage appeared in the TV version. On a DVD forum, I read that there was an entire Battle of the Coral Sea subplot tacked onto the televised edition. Unfortunately, none of that material appears here. I won’t complain too much about this apparent omission, as it’s already generous of Universal to include the footage we have. However, assuming my sources are correct that these shots do exist, it’s too bad they didn’t make the disc. By the way, if anyone wonders why the TV shots weren’t incorporated into an extended version of the film via branching, it’s because of their aspect ratio. The extra footage was created specifically for television, so it was all filmed 1.33:1. I guess they still could have put it in through branching, but it would’ve needed to be windowboxed to fit the anamorphic frame, and it would have been fairly awkward. One archival piece appears on Midway. They Were There is a six minute and 25 second featurette hosted by Heston. Although it existed mainly for promotional purposes, the program actually offered a solid little experience. We got information about the history of aircraft carriers and saw a lot of good archival footage. In addition, we heard from a variety of Midway survivors, many of whom inspired characters in the film. While “They Were There” provided a compelling piece, even if the rest of it stunk, it’d be worth a look just to check out Heston’s funky ascot. A few DVD standards round out Midway. A Photo Montage uses the format typical for Universal releases; it films the images and runs them as a three-minute piece backed by the movie’s score. It’s the usual mélange of publicity shots and it doesn’t seem like anything special. Offered in a 1.33:1 ratio, we get the movie’s original theatrical trailer. The Production Notes are decent, but they’re shorter than the usual detailed text found on many other Universal discs. Lastly, Cast and Filmmakers covers director Smight as well as actors Heston, Henry Fonda, James Coburn, Glenn Ford, Hal Holbrook, Toshiro Mifune, Robert Mitchum, Cliff Robertson, Robert Wagner, Robert Webber, Ed Nelson, James Shigeta, Christina Kokubo, and Edward Albert. All include filmographies and two screens of biographical notes expect for Kokubo, who only gets one page of text. As someone interested in the events of World War II, I found Midway to provide a reasonably compelling experience. The movie lacked much flair and style, but it covered the battle fairly well, and it offered enough drama and action to make it a worthwhile enterprise. The DVD featured decent but unexceptional picture and sound plus a modest complement of generally interesting supplements. The film failed to deliver a terribly rousing piece, but fans of the material should find it stimulating.